This simplistic design is futuristically inspired to the point that it has been given its own protective force field. This buffering layer wraps itself around the functional core like a piece of Wrigley’s Spearmint Gum, adding huge aesthetic interest to the design and even providing tasty voids and shelves that could be practically optimised and even individually personalised. 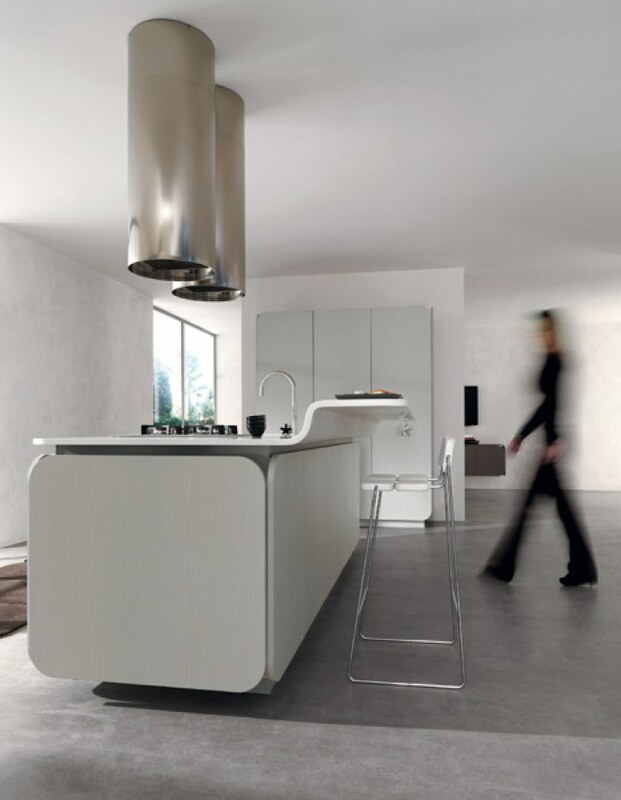 There is pod like feeling to this kitchen because the functional segments are independent, detached from each other, being characterised by soft curved edges. The outer wrap amplifies the soft edges further by capturing all of the independent elements together, making them whole and visually united. This design is also crying out for some atmospheric back lighting, a colour changing element that allows for mood reactions and human control. The spacing between the outer wrapping element and the functional core would be more intensely showcased if the space between could glow red and then blue and then yellow...a dimmer would also be good - providing ultimate control! A simple but brilliant design! You could be mistaken into believing that the photographer has got it wrong here; he had been sent to photograph a kitchen! Instead he has captured a slumbering example of function, a kitchen that is waiting to be wakened through the introduction of human animation. The use of open shelves on the island and the back wall section is excessive, but this is still a very practical design with the crumpled metal panel acting as the transformer, the curtain raiser for the functional core of this design. The staggered and layered approach to the island offers aesthetical interest to the viewer while providing a practical opportunity to get social while preparing and enjoying a meal. The material choices of stainless steel and walnut always offer a luxurious visual contrast that works every-time and this design is certainly no exception. This design is absolutely beautiful, a magnificent example of how contemporary kitchen design can be appreciated by architecture that doesn’t have the stereotypical hallmarks of a contemporary build. There is a growing trend at the moment that seems to point to a contradiction, a skewed alignment between kitchen and architecture that works brilliantly well! Classically styled architecture and interior design can soften the edges of a minimal kitchen concept and provide a subtle avenue for artistic expression. Doing this also makes contemporary kitchen design more accessible to those who don’t have a contemporary dwelling, so although this looks great and works well there may well be a commercial interest driving the notion of this style. Interestingly though this idea doesn't work as well in the opposite direction where you have contemporary architecture and a traditional kitchen! Whatever the reason....it looks fantastic. However, just to burst the bubble on this design! It is sprawling and the distance between the ovens and the hob is huge. The functional zones seem to have been compromised in the name of beauty; but if you own a kitchen of this size you might not mind having your personal chef walk a few extra feet now and again! Imagine unveiling this little cutie to all of your family and friends; there would certainly be a synchronised clatter of chins as they unceremoniously make contact with the floor. This effect would be followed by rapturous applause and an undisciplined charge towards the monolithic structure in order to get up close and personal with its shapely form. With smooth contemporary lines and transforming elements allowing the design to morph between states of use, this design by Minimal USA has certainly been created to become the dominant feature within any architectural space. This is a stunning design that also helps to illustrate how kitchens are being used to create definition within an open plan area! Walls are surplus to requirement! Hell hath no fury like a kitchen designer scorned! If you doubt the power and influence of modern kitchen design then The Mogul will be forced to unleash an implement of persuasion! This powerful design comes complete with medieval racking to tenderise the flesh of the unconverted and has optional surgical lighting to closely examine the impact of kitchen purification! It even comes complete with Braille cabinetry which could reveal powerful three dimensional secrets of the true origins and unseen future of modern kitchen design! 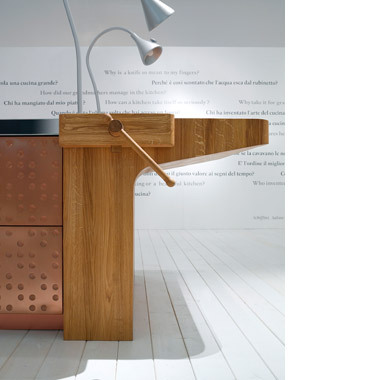 This kitchen by Alfredo Haberli for Schiffini throws the book at unbelievers, those who have cast a shadow upon the discipline of kitchen design! Be warned! Hell hath no fury like a kitchen designer scorned! People say that trends can go full circle and that fashions will re-emerge back into main stream popular culture! Are we witnessing the re-emergence of a kitchen design feature that had been consigned to the history books? Open shelves in kitchen design have been perceived as dust collectors, impractical voids that attract unwanted items of everyday clutter. But increasing in modern kitchen design these features provide the necessary aesthetic imbalance to present the required asymmetrical design trend! Even though the description used is the same, the design of the modern shelf is very different. Originally these open shelves would have been manifested as fancy wall quadrants, complete with decorative rails and fancy spindles. But these were times when the kitchen was shackled architecturally! Now the boundaries between kitchen and living space are blurred and these dust collectors actually serve a practical purpose! Your kitchen stores everything you need to prepare a meal but now it also stores everything you need to entertain! Books, CD’s and DVD’s can all find a place in the modern kitchen! The placement of open shelves in kitchen design is now fundamental to the progressive unification of kitchen and living space! Who was it said that a chair had to have 4 legs or that a car needed four wheels? Rules are made to be broken and it is challenging these boundaries that make design exciting. 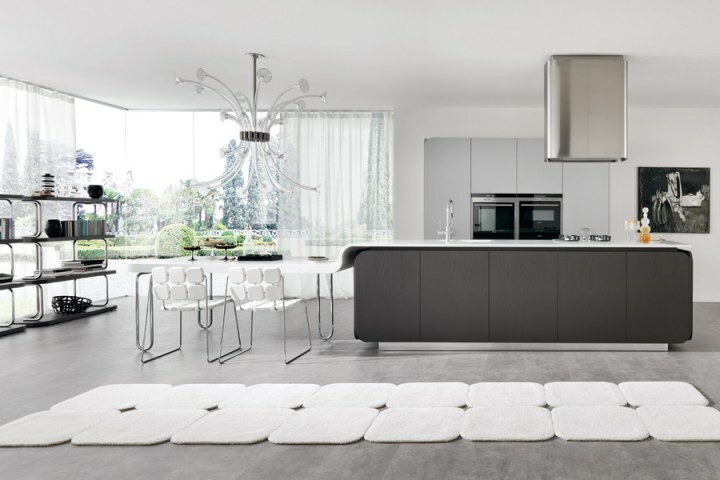 Contemporary kitchen design has always found comfort in smooth finishes and clean lines. The concept of having various components come together with seamless, calculated precision allowing the onlooker to be captivated and amazed at how man could be so chillingly accurate with basic tools! The reality is though that this exactness is still controlled by man but he now has a CNC machine in is arsenal of basic tools! 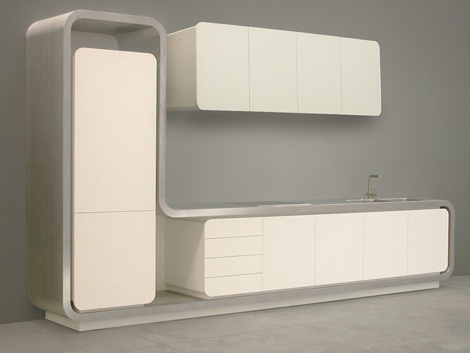 This design by Simone Micheli for Euromobil named “IT IS” decides to flaunt change right into the face of contemporary kitchen design. 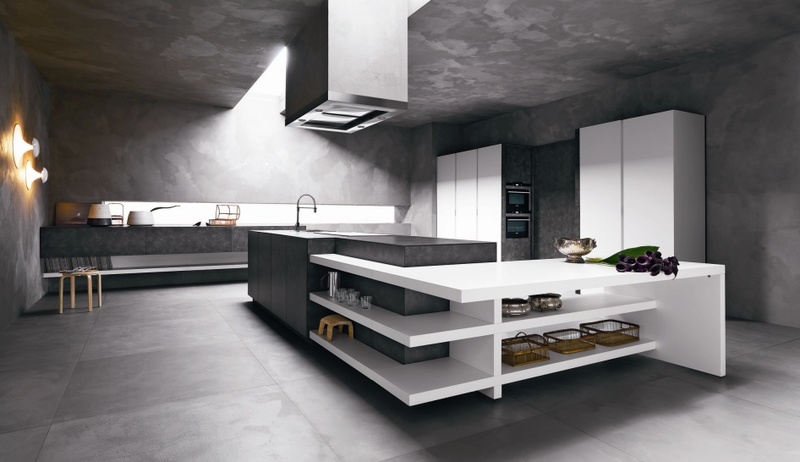 The smooth finishes are still present and the composition of the design is still very mainstream contemporary, but the fact that the doors and drawers have had the corners removed makes this design shine. 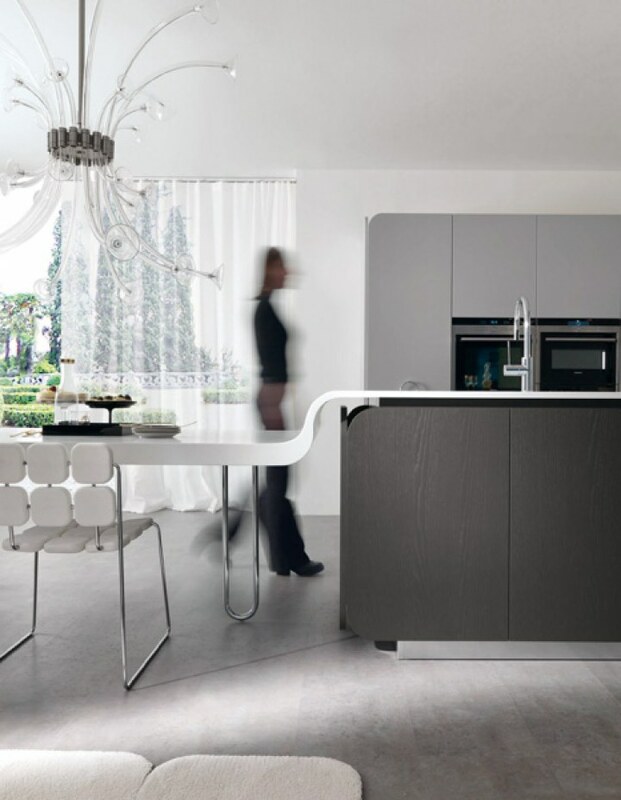 In one of the images you will notice that the worktop cascades from the island to form a table, the varied worktop thickness and smooth curved lines make the transition easy but it is what is happening underneath this element that most fascinates The Mogul. The combination of a finger grip cavity, corner-less doors and a gable section that refuses to meet the worktop presents an unusual sight....a void that shouldn’t be there. This element presents the viewer with a glimpse into the bowels of the beast and it is truly brilliant! You are either using your kitchen or you’re not! This simple fact is now playing a big part in kitchen design with morphing concepts being developed every day, allowing the kitchen to cater for our every whim and expectation. Some transformations are spectacular, outrageously automated, creating talking points and social envy while others can be created by gently introducing mood lighting and atmosphere. No matter what your budget or style it is important to think about how your kitchen will interact with you and your family when you are not actually using it to prepare meals. Will this important functional space promote a sense of calm, will it provide an opportunity for informal conversation and will it exude the essence of your own personal style? Functionality lays the foundations for kitchen design but the layers and options beyond primary use are endless! 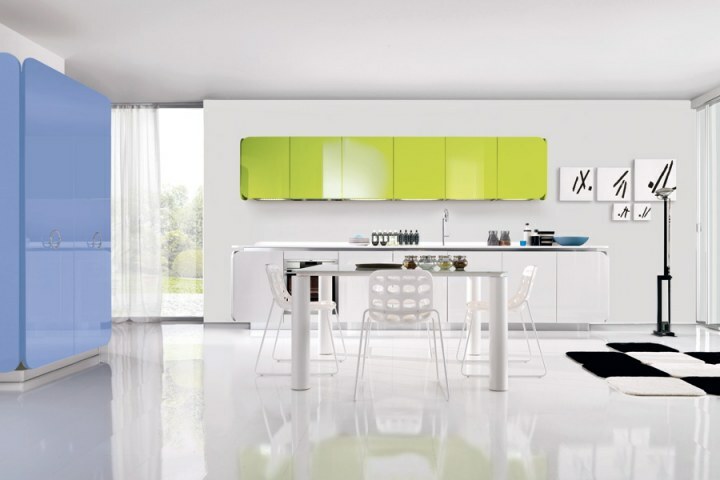 The removal of wall units and elaborate mouldings is becoming increasingly popular in contemporary kitchen design. This design has simple predetermined elements and is physically attached to the surrounding architecture but can it still be classified as being fitted? Is the modern kitchen now permanently in the state of “semi-fit”? Could it also be argued that kitchen design is becoming so calculated, premeditated and modularised that it loosing the artisan touch? Do skilled craftspeople now need only a battery drill to create modern masterpieces! The drive for efficiency can provide cost effectiveness but you can also alienate the skills handed down for generations! It is a fine line! 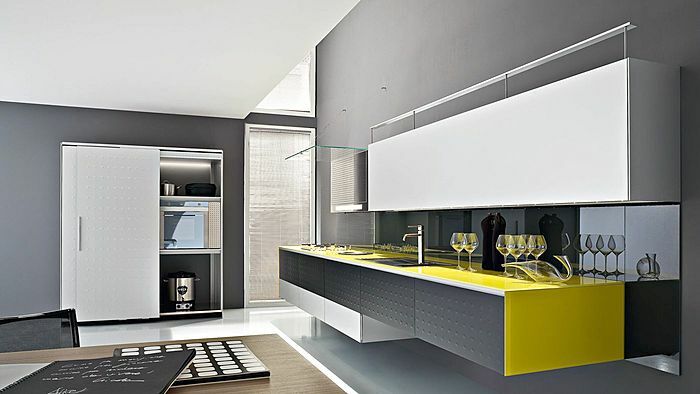 This design is simple and elegant providing us with a snapshot of contemporary kitchen style. 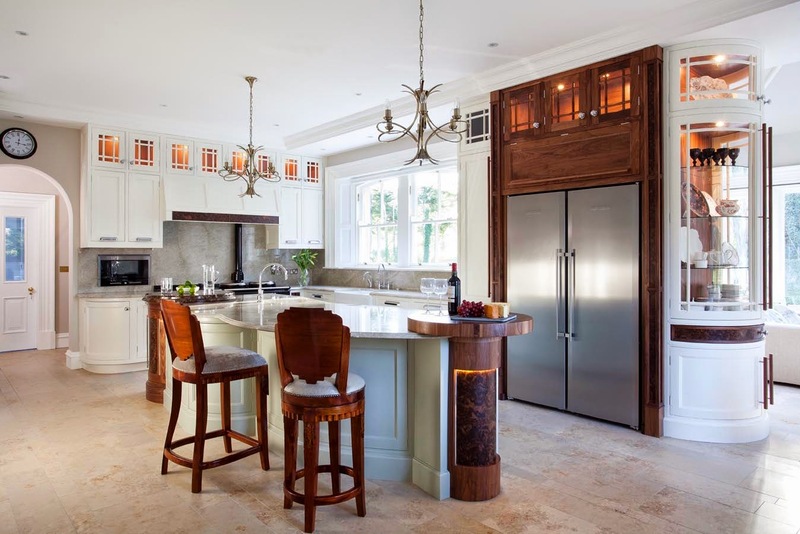 In this instance the kitchen doesn’t dominate the architecture, imposing itself with multiple layers of cabinetry; it only needs to present a subtle opportunity for function while seamlessly flowing into the living space. This design is even light enough to dress the architecture without having to touch the ground. 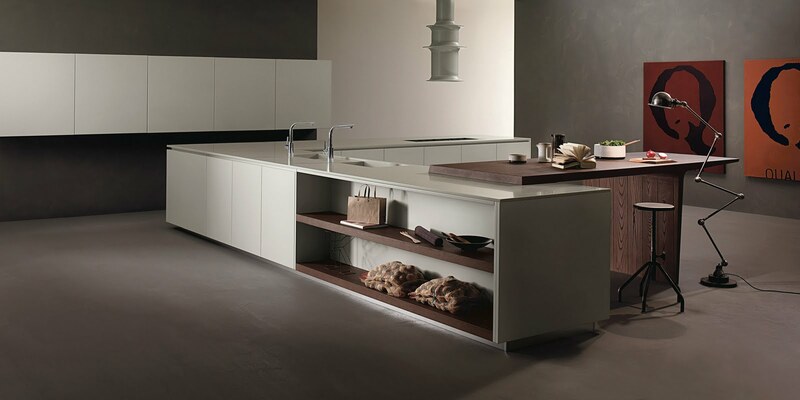 Using only four visible drawer fronts at the main cooking and cleaning zone conceals the functionality of this design, and just like a swan gliding across a crystal clear lake the power and effort of this concept is hidden beneath the surface only to be revealed when needed. The Mogul loves this one...the splash of colour on the wall really helps this design shine! You have to ask; at what point does the kitchen end and the art begin?! The answer will be found at the source of intellectual inspiration and the empathetic understanding of another’s needs. 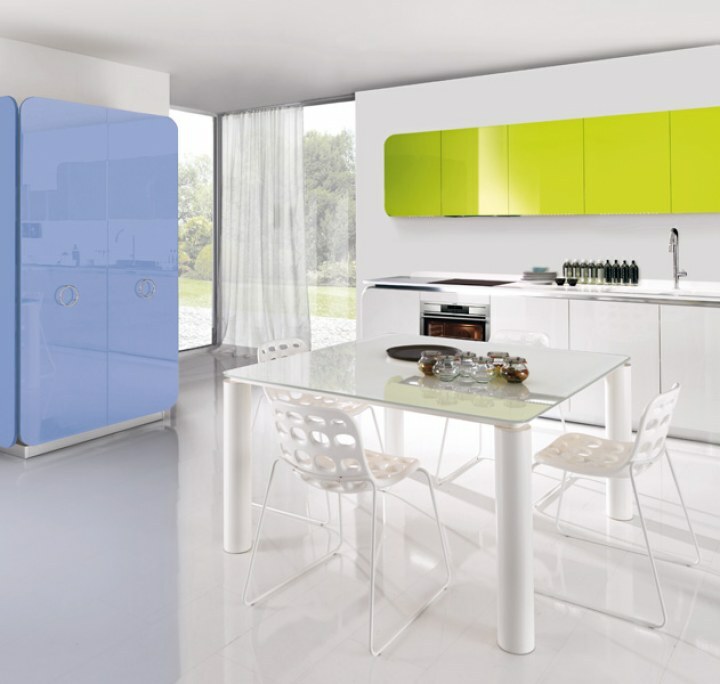 The modern kitchen is becoming a canvas for individual expressionism! Go on...express yourself! The kitchen is becoming an island but every now and again the surrounding architecture decides to reach out to grab hold of the kitchens new found influence. 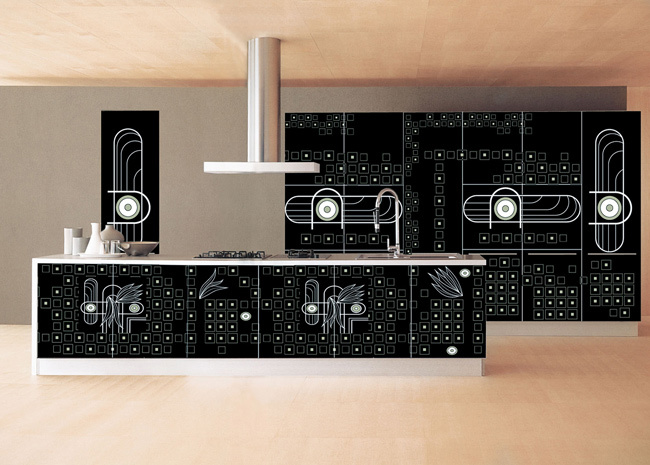 This design displays the resilience of the modern kitchen, brilliantly building upon its architectural foundations and highlighting the power of a fertile human imagination. There is a natural right to left movement within this design with the user obtaining consumable items from the dry and chilled storage area then gradually moving left, collecting non-consumables and then steadily working through the preparation and cleaning areas to finally end up at the cooking zone. The aesthetics are powerful too, with the low level cabinetry resting upon an impressive stainless steel hilt while vigorously lunging towards the high level units. The depth of the penetration is emphasised by using open shelving and a contrasting finish. This design is certainly sharp and has the ability to cut deeply into any architectural space! 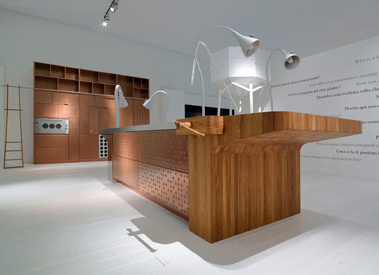 This concept is beautiful and is an example of how a kitchen should be designed. Design quality has preceded manufacturing quantity. 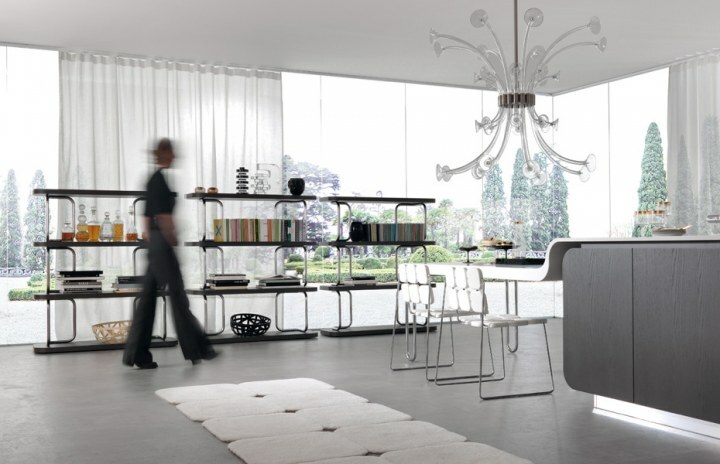 The designer has reflected what is important to the client and translated their desires into something special. All the modern kitchen design trends are here but the use of colour and texture as well as an innocent ignorance of traditional kitchen design legacy has allowed both designer and client to evolve. How you see this design will be influenced by where you live, who you know, what you do and what you aspire to be. On a personal level kitchen design can be controlled by the road you have trodden, but by considering the vision of others you can allow yourself to end your journey in a new and more enlightened place. This kitchen embraces the dominance of asymmetry in modern kitchen design, empowering the imagination and offering the eye something that is casual and yet calculated. The series of wall units in the first image look as though they have been splattered onto the wall by an uncomforting artist. And just as with splatter art the act is deliberate but the result is open to critical interpretation! The physical layering here is fantastic and presents an opportunity to cross-dress the kitchen, disguising it as something less functional; the perfect life-space accessory. The handless, free-hung, box matrix design which is only occasionally interrupted is brilliantly adorned by basalt ceramic finishes. 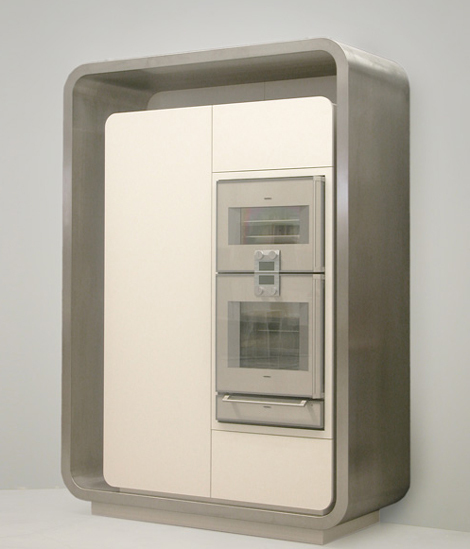 The use of a ceramic cabinet frontage opens the door into a whole new range of sensory pleasures. The colour of the ceramic fronted design mixed with the slender stainless steel worktops is great and having this accessorised with wood veneer and lighting only adds to the kitchen-less experience. Eventually the design cascades from the wall and has been given a set of landing gear to ensure the touchdown is smooth and effortless! Sometimes presenting wall units in this way can be perceived as being a gimmick, a hook to get the design noticed but in this instance the flexibility and use of materials just make this a good design! We all demand a little luxury from time to time, the ability to switch off from the daily grind and experience an indulgence of pleasure, gratifying all five of our senses and allowing us to feel revitalised and refreshed. 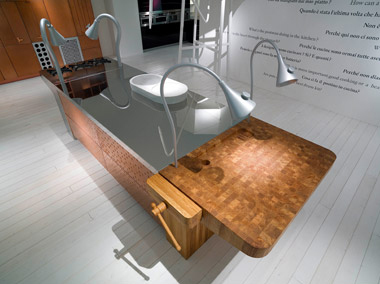 In the field of kitchen design there is mounting pressure on designers to create not just a functional space that caters for every requirement, but to create a breathtaking, interactive experience for the user. Modern luxury kitchens must have a Zen like quality, the ability to promote calm and offer mood setting control to the fortunate owner. There is no better way of doing this than to integrate some lighting into the design. Design Republic came up with this design which has all the quality hallmarks that can make the mouth water without the smell of food! This design embraces interactive LED lighting in a powerful way and in some of the images the impact almost appears overpowering, allowing the kitchen to transform into a nightclub! But isn’t this what we all want? A controllable, adaptable space, which can be a kitchen by day and a social hub by night?! Owning such an example of functional sensory extravagance can bring with it (comes in a separate box) a quiet satisfaction that you have something different! There is the opportunity to wallow in the social adoration that will be bestowed upon you by friends and family as you demonstrate how the new kitchen works. And in a kitchen like this you will find that the owner will not choose to demonstrate their new fan assisted oven, this will present an opportunity for a lighting show! Kitchen design is all about identifying needs and challenging the norm. This design is exceptional for loads of different reasons but it is a shame that many designers never ever get to meet clients with deep enough pockets to release their imaginations like this!